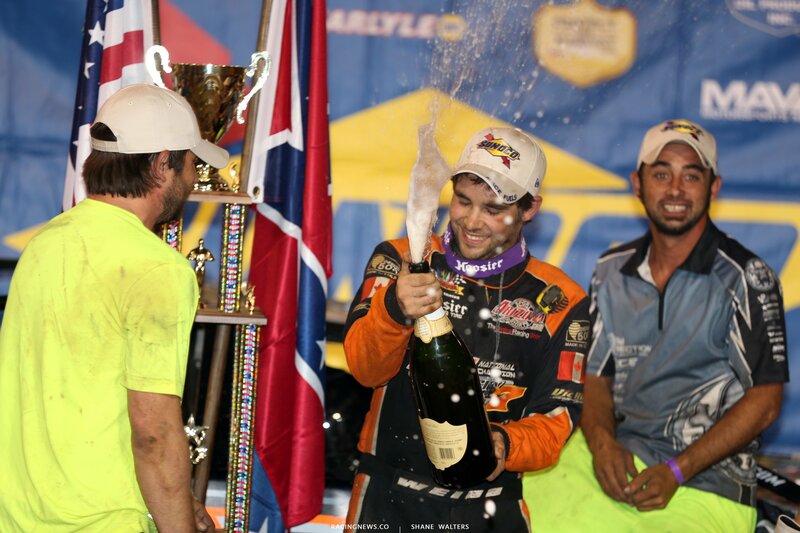 Tonight, the North South 100 weekend in Union, Kentucky comes to a close. 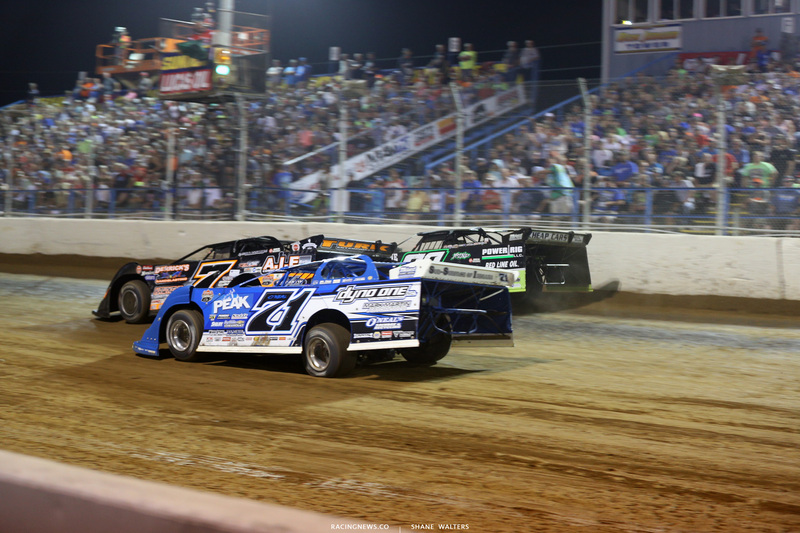 Florence Speedway is set to host the national late model series on the .5-mile dirt track. 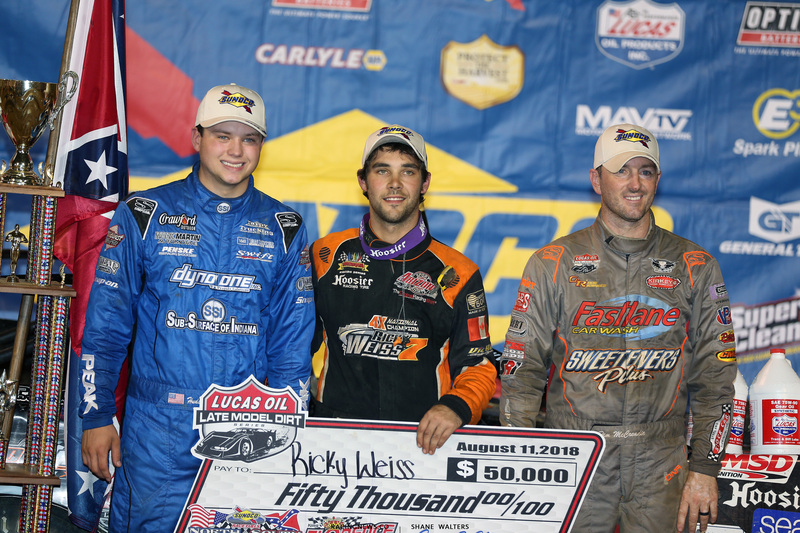 The 100 lap main event will pay $50,000 to the race winner. View full 2018 North South 100 race results below. It’s the final night of racing in 2018 for Hudson O’Neal. In less than a week, he’ll have shoulder surgery. That will be followed by several months of recovery. However, he’ll be starting tonight’s main event from the pole. It rained at about 6pm tonight. As a result, the show is getting a late start just past 8pm. Gregg Satterlee and Josh Rice set the front row for the first B Main of the night. Green, Satterlee gets the jump, he leads into turn 1. Lap 5, Satterlee leads Rice by two car lengths. The track is tacky and qualifying ready. Lap 10, Satterlee is trapped behind a lap car. Rice closes right to his rear bumper. Lap 14, they split the lap car. Satterlee takes the win in B main number one. Rice grabs the other transfer spot. Zach Dohm and Scott Bloomquist will lead them to the starting line in the second b main of the night at Florence Speedway. Green, Dohm gets the jump on the bottom. Dohm noses ahead into turn 1. Bloomquist is hard on the gas around the top. He pulls even through the middle of turns 1-2. Bloomquist swings to the lead on the outside if turn 2. 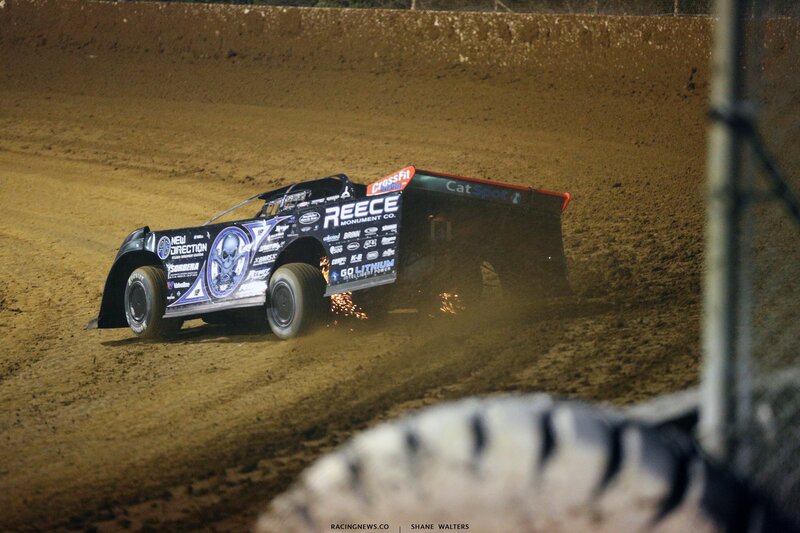 Bloomquist is driving away from the field. Dohm is under pressure from Bronson for the final transfer position. Lap 9, caution. Green, Bronson to 2nd. Bronson is looking for the lead of turn 2. He makes contact with Bloomquist. The #0 has lost a left rear tire. Bloomquist exits the track. Green, Bronson leads. Dohm is coming. Last lap, Dohm is looking for the lead on the bottom. The top is too strong. Bronson wins B main number two. Dohm runs 2nd. Jared Hawkins and Josh Richards will lead them to the starting line in B main number three. Green, Boggs is looking to make it three wide from row two, he lifts. Boggs has a run off turn two. Boggs takes it to the bottom in turn three. Boggs slides up the hill just in front of Hawkins. Boggs to the lead off turn four. Lap 4, caution. Trouble in turn one. Green, Boggs leads. Tyler Erb is putting pressure on Hawkins. Craig Johnson is around Erb. Johnson has smoke coming out the back of his car as he tries to race his way in. He’s going to come up one position short. Boggs wins the final B main of the weekend. Hawkins grab the last transfer spot. Next up, it’s a 100 lap main event. The race winner will hit the road with a check for $50,000. Scott Bloomquist and Josh Richards will take provisional starting spots. 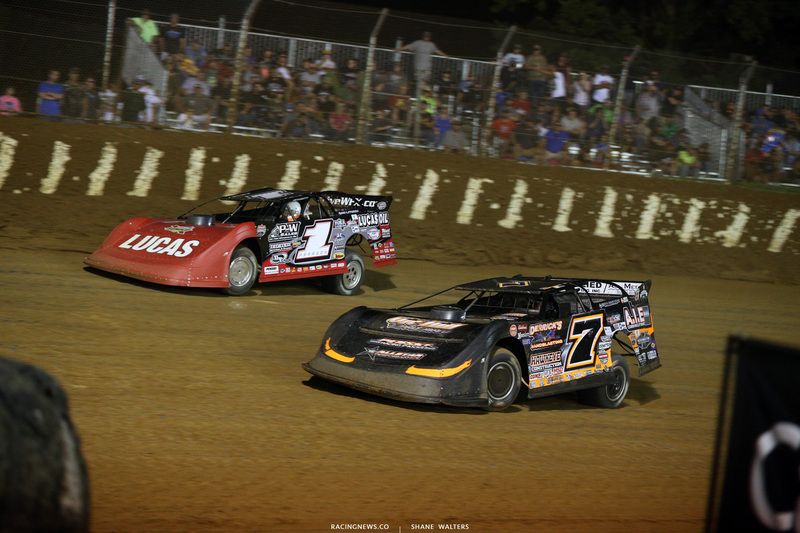 Darrell Lanigan and Dennis Erb Jr receive LOLMDS emergency provisionals. Hudson O’Neal and Brandon Overton trail the pace truck ahead of tonight’s North South 100 main event. 4 wide salute for the Kentucky dirt track racing fans and we’re off. 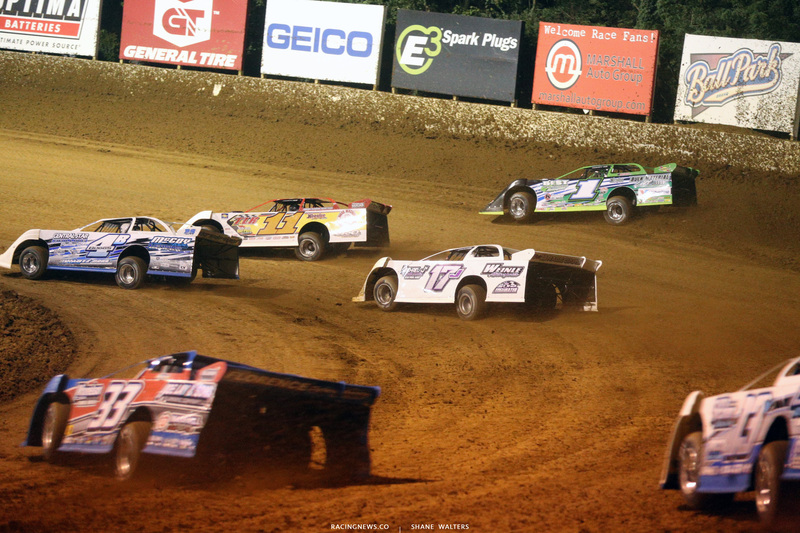 Green flag, O’Neal and Overton run side by side into turn 1. They’re side by side off turn two. 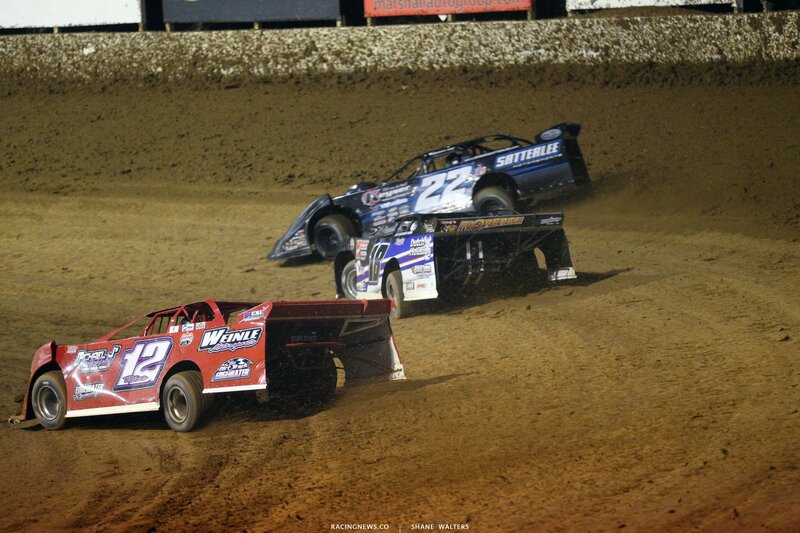 O’Neal slides him into turn 3. Pearson followed him by Overton. Pearson is going for the lead. The caution is out. Hudson will get the lead back. Green, Hudson O’Neal leads. Pearson takes 2nd. Erb is looking for the lead on the bottom into turn 3. Pearson pulls even but O’Neal has the momentum off the top. Lap 8, Earl Pearson Jr is looking for the lead again in turn 1. He gets to the right rear quarter panel. Pearson takes the top off turn 2 and leads into turn 3. Lap 16, Pearson is deep in lap traffic. Weiss is closing. Caution, Pierce has a flat. Green, Pearson leads. Lap 18, Chilton is slow on track. The caution is back out. Green, Pearson opens up a 5 car length lead to Weiss. Lap 33, Pearson is deep in lap traffic. Weiss is closing. Overton is slow on track. The caution is out. Lanigan, McCreadie, Satterlee and more hit the pits. Green, Pearson leads. Weiss reclaims 2nd. Owens is working on Hudson O’Neal for 3rd. Owens is through on the bottom. Lap 40, Weiss has a look at Pearson on the bottom into turn 1. He pulls even but Pearson powers back by on the high side off turn two. Lap 56, Pearson leads Weiss by three car lengths as they race through lap traffic. Lap 59, slow car in turn 4. The caution is out. Bloomquist heads to the pits. Zeigler and Davenport hit the pit lane as well. At the last minute, Pearson heads to the pits as well! Weiss will take over the lead! All those cars return to the track. Green, Pearson stops on the front stretch. He wasn’t caught up to the field as they went green. Pearson has his hand out the window as he drives by the tower. The caution is back out. Green, Jimmy Mars is around in turn two! Davenport goes high to avoid it. Bloomquist goes low. Pearson is left with nowhere to go. Pearson jacks it sideways and slides right into Mars. Heavy right rear damage for Pearson. Green, Weiss leads Hudson O’Neal. Hoffman is making up ground on the top. He’s the only car in the top 10 running up there but he’s making it work. Hoffman dropped through the field early in this race. He might have just been saving his tires. Lap 65, Satterlee is slow. The caution is out. Green, Weiss leads. Owens and Hudson O’Neal battle for 2nd. Hoffman and McDowell battle for 4th. Lap 76, Bronson jumps the cushion in turn 3. Pearson and Satterlee return to the pit area. Green, Owens gets a run on the top. Hudson O’Neal gets a run on the bottom. They run 3 wide at the flag stand. Weiss leads off turn 2. Owens to 2nd. Lap 87, Mars is slow down the back. Bronson, Don O’Neal, Richards and Pierce hit the pit area. Green, Weiss leads. Hudson O’Neal takes over 2nd off turn two. Back in turn 1, Hudson O’Neal cuts to the bottom. He’s looking for the lead off turn two! They run side by side for the lead. O’Neal noses ahead but Weiss powers by off the corner. Lap 91, Hoffman jumps the cushion in turn 4 and makes contact with the wall. The caution is out. Green, Weiss leads. Hudson O’Neal is 2nd. Owens is fending off McCreadie for 3rd. McCreadie takes it on the high side. McCreadie is flying around the top. Weiss has opened a 10 car gap. McCreadie is all over O’Neal for 2nd. MCreadie takes the spot. Weiss is gone in the distance. 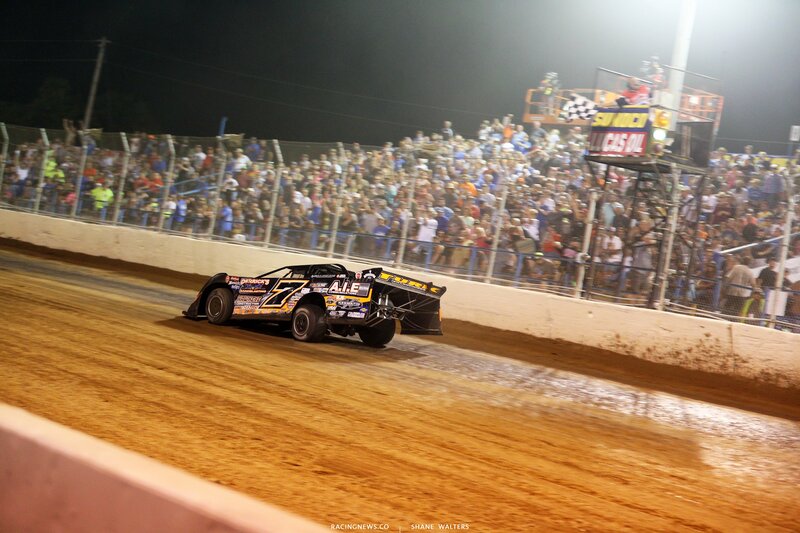 Weiss takes the win at Florence Speedway! From here the tour heads to Batesville Motor Speedway in Batesville, Arkansas. View full 2018 North South 100 results below. 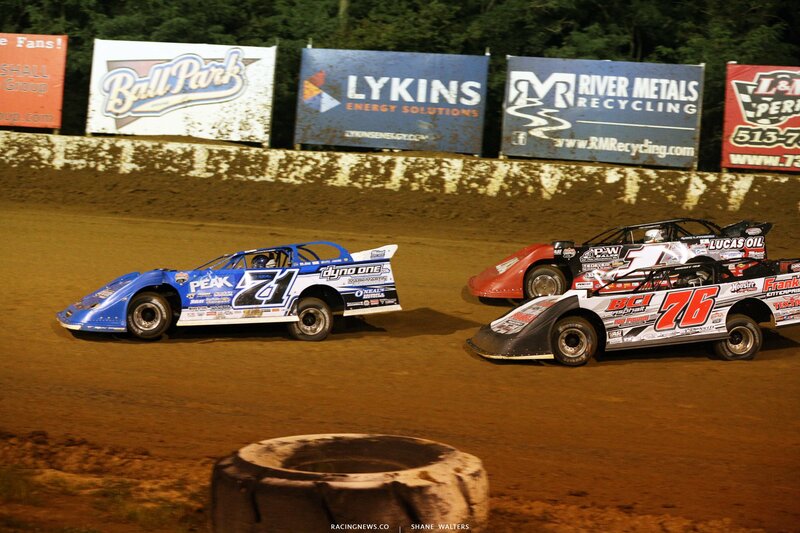 Click here to view North/South 100 heat race results from the night before.